In a perfect world, employees would arrive at work each day with bright smiles on their faces, eager to be productive and engaged with their colleagues. But, the sad truth is that a vast number of employees are either disengaged or on their way out of the organization. According to Gallup Poll, nearly 66 percent of all employees are disengaged, leaving only about one-third of the workforce actively participating in their jobs at full production. This averages out to hundreds of billions of dollars a year in lost production. Engagement: Determining how committed employees are to the company and creating measures to increase the intensity levels of individuals to see the connection between their actions and the company objectives. Enablement: Creating the opportunity for employees to work up to their full capacity while experiencing the appreciation of management, even if there are limits on budgets and human resources. Energy: Developing a corporate culture where employee well-being is promoted and practiced on a regular basis. Building programs for reducing stress and improving work-life balance. Therefore, when a company wants to develop more employee engagement, they must first start by examining the above elements and making positive changes at the operations management level. Only then can incentives and benefits alter employee performance and happiness. Everyone can benefit from taking a little time off once in a while. Organizations that want to support a happier workforce understand this, therefore they provide flexible time off policies that add to the overall work-life balance. Want to take it up a notch? Provide travel discounts, working vacations and group day outings to allow employees to blow off steam. When employees can experience the rewards of business profitability, this can be a powerful incentive for them to hustle at work. Therefore, adding a company stock ownership or profit sharing program can be a big benefit. With thousands of Baby Boomers leaving the workforce daily, the need for strong retirement savings plans is high on the list of priorities for many employees. This is also true for those who are in their 30s and 40s, as they will be busy earning as much money as possible to boost retirement plans. Companies can set up an automatic retirement savings plan and match 50 cents on every dollar that employees contribute to help boost retirement savings. The learning and professional development market has exploded since the evolution of online and remote classes. In addition, there are still many working adults who are reinventing themselves as a result of the recession which took away many jobs. Having a program that provides on-the-job training at no cost to employees can be a major boost to employee engagement and productivity. Make sure that there are many ways for employees to learn both on and off the job, such as support for college tuition, industry certifications and community events. There are millions of adults working from home at least a few days a week. Even those who work full time on business campuses are less likely to sit at desks all day because of the use of mobile technology. A workplace that creates mobile-friendly work options, such as telecommuting, holding meetings offsite and offering flexible work hours can be a great way to improve employee productivity and happiness. A company that wants to inspire its workforce understands the need to transfer skills and knowledge from one generation to the next. Create a legacy learning and coaching program that matches seasoned leaders up with mid-level employees who will be ready to take that next step in their careers. Mentors can boost morale and they can also give the business an edge by deepening the core values that the company has developed. Set up mentorship meet-and-greet programs often. Employers are continually recognizing how critical the wellness and mind connection is for employees. When employees are healthy, they are happier and can work up to their full abilities. Wellness programs can be rolled out for a small investment and can include simple programs such as on-site nutritional support, walking programs and health fairs. Today’s employees are looking for the entire package when it comes to their work experience. They are no longer willing to work in stifling cubicle farms with no windows or anything pleasant to look at. Companies that take the time to improve the work environment with soft seating arrangements, collaborative workstations, pleasant artwork, lighting and live plants are going to find that this translates to happier employees. Making some changes in the workplace can help a company see an almost immediate boost in employee mood. An overwhelming amount of debt stemming from credit cards, student loans, housing costs and more weigh on many employees. Many people just don’t know how to manage the money they earn. A company that invests in the financial education and well-being of its workforce can help employees to experience the freedom of getting out of debt and living within their means. 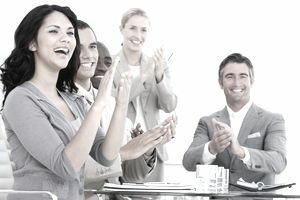 Along with being connected to the profitability and success of a business, employees often look forward to celebrations. And why not celebrate their hard work and contributions? Have at least an annual celebration that includes all employees, including those that are family friendly. For example, there could be a week-long celebration with a fun theme, so employees can dress up for a costume contest, decorate their workspaces or participate in a chili cook-off. The greatest perk you can give your employees is the chance to have a voice. Employee engagement surveys, pulse surveys, and brainstorming sessions allow employees to speak up in an environment where they can feel safe and validated. Use a third party employee survey firm to handle the details and keep things confidential. Hold brief staff meetings with participants asking them to come up with workplace improvement ideas. Many employees enjoy the chance to gain professional and personal recognition for a project of their choosing. These can be community-based projects or initiatives that are industry related and promote the company in a positive light. Find out what causes employees are participating in and how the company can get behind them. Introduce the concept of employee social journalism into the day to day activities of the company to create culture and engagement. The above perks and benefits can be excellent incentives to get employees excited about their work again. Set up bonus and recognition programs to foster employee well-being even more. A little can go a long way, with the right effort from the company.